Vortex OpenSplice is the most advanced, complete and widely used (Commercial and Open Source) implementation of the Object Management Group's Data Distribution Service (OMG DDS) standard. 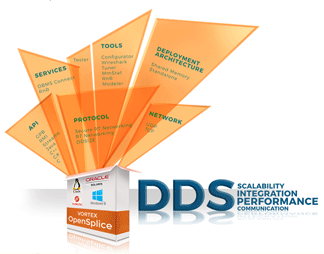 Vortex OpenSplice enables data to be shared and integrated across a wide spectrum of operating systems and platforms. It provides a full implementation of both the OMG DDS latest rev1.4 (DCPS profiles) and the OMG-DDSI / RTPS v2.2 interoperable wire-protocol standards. It is targeted for use with server-class (desktops, racks etc.) platforms as well as more specialized real-time embedded environments and operating systems (e.g. single board computer running VxWorks). Data Centric - enabling applications to be designed around an extensible and evolvable data model, promoting end-to-end type safety and time and space efficiency. In addition, data-centricity promotes time and space de-coupling leading to systems that are easier to integrate, evolve and reuse. Real-time - the right information is delivered to the right place at the right time, all the time. Failure to deliver key information within the required deadlines can lead to life, mission or business threatening situations. Dependable - ensuring availability, reliability, safety and integrity in spite of hardware and software failures. High-performance - able to distribute very high volumes of data with very low latencies. Scalable - from simple systems to ultra large scale system-of-systems and from smart sensors to high end servers. Secure - provides the ability to maintain confidentiality, integrity and authenticity of exchanged data.